KidsEBookBestsellers.com: COUNTING BY 7s: A Top Ten Hit with Kids in the iBook Store. COUNTING BY 7s: A Top Ten Hit with Kids in the iBook Store. On June 27th Counting by 7s by Holly Sloan hit the number 7 spot in the Kids section of the iBook store. Since then it has popped up to the top ten several more times. In addition to writing bestselling books, Holly also has written and directed a variety of feature films. She has made her living by writing since she was in her 20's. Today we get to hear all about her e-publishing success. 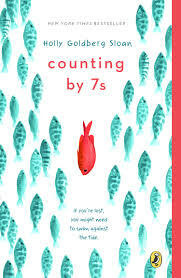 Counting By 7s is about a young girl finding a new life following a tragedy. My novel was published by Dial, a division of Penguin Random house. I'm 56 years old and I've been a writer for movies and television since my 20's. I have had representation since then, and I think getting a strong agent might be more difficult than getting a publisher. My book has been nominated for 34 state awards and is currently in publication in 19 languages. I believe that there is something very universal about the story, and while it certainly has parts that are sad, I feel it is a very hopeful book. And who doesn't need hope in their lives? I do not do any marketing myself and I'm not the best person at social media. I'm on Twitter but I mostly re-tweet things that I find interesting. I do not have an army of followers. I believe that children in general are reading more. It is possible that the are reading short bursts of language, versus long sections of text. But reading is reading. It is a profound part of the human experience to take symbols and be able to translate them into words, which are ideas and emotions. I believe that most books are put into categories in order to organize them for selling purposes. The target audience for my book is probably someone at least 12 years old. But I truly believe that adults may enjoy or appreciate the story more than young people. I don't think my publisher feels this way, but I do. However I believe the right book and the right time, can have a big impact on your life. Maybe books that ask questions about identity and family and the nature of love are more important when you are young. My publisher believes that all formats are vital in order to reach the modern reader. I leave those decisions in their hands. Thankfully. No. However I wouldn't have thought that I'd be interviewed specifically about e-publishing, so perhaps that is unexpected? I have a book publishing on August 11th and I'm VERY excited about that. It's called APPLEBLOSSOM THE POSSUM and the best way I can describe it is to say that it's somewhat like CHARLOTTE'S WEB. Animals in our world. It is a novel, but it is the first one I've done with illustrations and they were drawn by my husband, Gary A. Rosen, so that is very meaningful to me. The audiobook for APPLEBLOSSOM THE POSSUM was recorded by Dustin Hoffman and we spent five days in the recording studio. The experience was one of the highlights of my career. The other part of the audiobook that feels so special is that my friend, Ry Cooder (perhaps best known for the Buena Vista Social Club) recording music for the story. Almost five minutes of original music from Ry is in the audiobook. I can't tell you how thrilling it was to be with him when he played all of the instruments that day. I think it's like TV and the movies, when TV first arrived on the scene. Movies did not disappear. The experience of watching a movie in a theater is still something that is part of people's lives. Television didn't close that down. Both things can exist. No. I want believe to read and for some people it is easier, more economical, and even necessary (with the ability to adjust the size of typeface). E-reading is here to stay. I see kids reading books on their phones today. What's important to me is the experience of reading. It's different from the experience of simply watching. Reading asks you to be the cinematographer and the wardrobe designer and the set decorator. It makes you the person in charge in a way that being an audience member in a movie theater does not do. If the e-format makes it easier for kids to read a book in a dark room or take 8 books away on a trip, then more power to the format! Learn more about Holly and her books by visiting her website or by following her on Facebook or Twitter. See the latest Kids' EBook Bestseller List for more top ten e-format authors and their books. It's updated every Saturday morning. Check back next week when my featured author will be Tony Bertauski.